Ukrainian President Petro Poroshenko has voiced his discontent over the Indian authorities' approval of a recent visit to Delhi by Republic of Crimea head Sergei Aksionov. Speaking in Sydney, Poroshenko accused India of paying "more attention to money" that "the value" of Aksionov's visit. India was opposed to the West imposing sanctions on Russia over the reconnection of Crimea. The Ukrainian president said that India was standing aside from "the rest of the civilization." 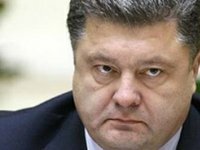 "It was not easy to rally the world [against Russia]," Poroshenko said. "India's position will not help or save Aksionov," he added. On December 11, Aksionov was in Delhi on his first foreign visit as the head of Crimea, his spokesperson Katerina Polonchuk told Interfax. On Thursday, Aksionov signed a memorandum of cooperation between the Republic of Crimea and the Indian-Crimean Partnership organization, which includes Indian business people, she said. "The main areas in which we will work together are agricultural products processing, tourism, pharmaceutical production, and the supply of food products to the Republic of Crimea," Aksionov told reporters in New Delhi after singing the memorandum.